In a previous article http://celtic2realms-medievalnews.blogspot.ie/2018/01/pirton-manor-in-hertford-andireland.html the property of the Oddingeseles family at Pirton in Hertfordshire was examined and how in the fourteenth century it passed to the Anglo-Irish family of Caunton in County Cork in Ireland. This article highlights other Oddingeseles lands in England. The information on each property is not the whole story of each property and additional information from other sources can add new light to each story. Eperiston = In 1314-5 Payn de Tibtoft held the manor of Eperiston with the advowson jointly with his wife, Agnes by the enfeoffment of William Saunsun which was further held of Sir John de Oddingeseles by the service of half a knight’s fee. In November 1328 Agnes, wife of the late Payn de Tibtoft, held Eperiton for life by the service of a quarter of a knight’s fee from Sir John de Oddingeseles. In 1367 Sir John Tibetot held Eperiston manor with the advowson of the church and a deerpark, for life, by gift of William Deyncourt, ex lord of Graneby, and Thomas de Hameldene, parson of Potterhayn church, from John de Oddingeseles as of his barony of Long Ichyngton (Longichynton) by knight’s service. John Tibetot was married to Margaret, daughter of Bartholomew de Badlesmere and Robert Tibetot, his son, was heir along with the heirs of Margaret who predeceased her husband. Roland de Oddingeseles died in 1315-6 having held land in Oxfordshire. These lands were Kelmescote, Fylkyngehe and Halewell (Broadwell parish). Here there was no land in demesne but 100 acres and some rents which were formerly held from the abbot of Cirencester by the service of a pair of gloves per year. Yet long before Roland died the lands were alienated to Walter Spryngaud, Roland son of Roland and others. In 1354-5, William de Clinton, Earl of Huntingdon, held the services of these three hamlets (Filking, Halewell and Kelmescote) with the services of Bradewell town jointly with his wife, Juliana, of the king in chief. These were grouped as part of Guting manor in Gloucestershire. 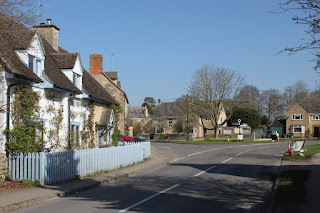 Bradewell (Broadwell) = in 1336-7 Sir John de Oddingeseles held half the manor of Bradewell jointly with his wife Emma who survived him (she subsequently married Sir William Corbet). They had it by a fine at the king’s court to hold it in chief by service of a fifth part of a knight’s fee and to the heirs of the said Sir John. De Oddingeseles left as heir his son John aged 24 years old. In July 1347 Emma de Oddingeseles held Bradewell manor for life by the inheritance of her late husband, John de Oddingeseles, by the gift of Ralph Bygot. John de Oddingeseles (ages 36), was the son and heir of John and Emma. At the same time Emma de Oddingeseles held half of Pirton manor in Hertfordshire. In 1352 John de Oddingeseles held Bradewell manor which included 200 acres of arable land (120 planted and 80 fallow) and 20 acres of thick wood. In 1354, William de Clinton, Earl of Huntingdon, and Juliana his wife held the services of Bradewell town as part of the holdings of Guting manor in Gloucestershire along with other former Oddingeseles property in Oxfordshire as noted above. In 1361 Amicia, the widow of John de Oddingeseles, held Broadwell manor for life as part of her dower property and was succeeded by her son, John de Oddingeseles (then aged 26 years). In 1369 Agnes de Mauduyt, widow of John de Mauduyt, held a messuage and one carucate at Netherfilkyng as of Bradewell manor (property of John de Oddingeseles) by the service of one penny per year. Stanlake = in 1352 John de Oddingeseles held a fourth part of the manor of Stanlake jointly with his wife, Amice, by the gift of her father, Roger Corbet, in the honor of Aumale by the service of quarter of a knight’s fee. In 1361 Amicia de Oddingeseles held a fourth part of Stanlake for life by demise of Sir Robert Corbet with reversion after the death of Amicia to Edmund Giffard and Margaret, his wife, and Edmund, their son. Stanlake was held of the king in chief as part of the fees of the earldom of Aumale which fees were previously granted by King Edward to his daughter Isabel. In 1369 Agnes, wife of the late Sir John Mauduyt, held the manor of Stanlake and every fourth presentation to the local church. The manor was held in chief of the king by a quarter knight’s fee within the honor of Aumale. William de Molyns (25 years), son of John de Molyns and Gille (Egidia), his wife (both deceased) was the heir of Agnes de Mauduyt. In 1375 John de Grey of Rotherfield held a fourth part of Stanlake manor jointly with his wife Maud at the time of his death. Many years previously John de Grey gifted the fourth part for life to Edmund Giffard of Stanlake and Alice his wife. The property was held of Lord de Courcy in right of his wife Isabel by service unknown. In 1429 William Molyns held a quarter of Stanlake manor (worth £9 5s) of the king in chief by the honor of Albermarle. He was succeeded by his three year old daughter, Eleanor. In the reign of Henry V Lewis Grevyll and Richard Mikelton, clerk, granted the manor of Stanlake (worth £4 and held of the duchy of Lancaster) to John Grevyll of Gloucestershire and Sibyl and their heirs with reminder to Guy Corbet of Suffolk. John Grevyll held Stanlake fter Sibyl’s death until his own death in September 1444. John Grevyll had a son, John Grevyll, by his second wife Joyce and Guy Corbet died in the lifetime of John Grevyll leaving his son, Robert Corbet, as heir. Alre = In 1312-3 John de Acton held half the manor of Alre, Somersetshire from John de Oddingeseles by the service of 1 knight’s fee. In 1086 (Domesday Survey) Ralph de Limeseo (Limesy), an ancestor of John de Oddingeseles, held Alra manor. By a further inquisition we find the manor of Bradewell, Devon held by Ralph Pyn from John de Acton for a knight’s fee pertaining to the manor of Alre which is said to be held from Hugh de Oddingeseles. Hugh de Oddingeseles was the father of John de Oddingeseles and died about 1304-5. In 1325-6 Sir John de Clyvedone and John de Acton agreed on certain clauses touching Alre manor in Somerset and by such transactions John de Clyvedone could confirm the age of Edmund, son and heir of William de Cheyne. Berlaston = in 1352 John de Oddingeseles held the hamlet of Berlaston jointly with his wife, Amice, as a gift from her father, Roger Corbet, by the service of 10s yearly to Ralph, Earl of Stafford. John de Oddingeseles junior was his son and heir and was then ages sixteen years. The same John de Oddingeseles senior held half of Pirton manor in Hertfordshire. In 1372 held Ralph, Earl of Stafford, Berlaston (Barleston) manor with the hamlets of Hertwell and Titnesovere of the king in chief. In 1423 Hugh Stafford held Berlaston manor from Stone priory with its 14 messuages (worth nothing), 480 acres of land (3d per acre), 30 acres of meadow (6d per acre), 80 acres of pasture (1d per acre) and 44s of assize rent. Hugh Stafford also held the manors of Hertwell and Tittensor from Stone priory. Kavendych = in 1352 John de Oddingeseles of Pirton (Hertfordshire) held the manor of Kavendych from the king by the service of an eight part of a knight’s fee. John de Oddingeseles, junior, was his son and heir. In 1436 Richard Wegge held half the manor of Cavendish, otherwise called Netherhall (worth 20s) in chief to the king by the service of one twentieth of a knight’s fee. Isabel his wife held it for a time after her husband died until her death on 6h June 1436. The next heir was John Claveryng, son of Richard Claveryng and Margaret, daughter of Richard Wegge. Arley = in 1294-5 William de Oddingeseles held the advowson of Sir Hugh de Oddingeseles. In 1311-2 John de Grey of Rotherfield held the advowson of Arley church by the inheritance of Margaret, his wife, from Sir John de Odingeseles John de Grey also held Solihull by the same terms. In 1325-6 Peter de Lymesy held the manor of Arley from John de Oddingeseles by the service of half a knight’s fee and John de Lymesy was his son and heir. Peter de Lymesy acquired Arley from his father Richard de Lymesy who got it from his brother Sir Ralph de Lymesy by a grant for life. Richard de Lymesy gave Ralph de Lymesy £200 and promised to pay Ralph de Lymesy ten marks per year for the life of Ralph in return for Arley. In 1423, Elizabeth, widow of John de Clinton, held the advowson of Arley church in dower by endowment of Robert de Grey of Rotherfield, her former husband. The advowson was worth 10 marks and the daughters of Joan, daughter and heir of Robert de Grey, were the heirs. Buddebroke = in 1294-5 William de Oddingeseles held a knight’s fee at this place from Sir Hugh de Oddingeseles. In turn the same knight’s fee was held from William by Theobald de Nevyle and John Hastang. In 1337 Thomas de Hastang held half a knight’s fee at Buddebroke and the other half was held by Theobald de Verdun. Another inquisition held about the same time said that half the knight’s fee at Buddebroke was held by the heir of Philip de Gaiton while the other half was held by the heir of Robert de Hastang. This implies that Theobald de Verdun was overlord of the full fee but a third inquisition into the estates of Theobald said he only had a half fee at Buddebroke. 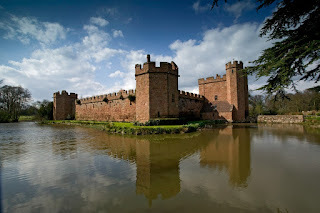 In 1369 Thomas de Bello Campo, Earl of Warwick, held Buddebroke manor and La Grave by the gift of Sir John de Hastang who held the property from John de Clinton of Maxstoke by service unknown. In 1371 Sir William de Ferrers of Groby held half of a knight’s fee at Buddebroke with the heirs of Robert de Hastang holding the other half. In 1425 Richard Beauchamp, Earl of Warwick, held Budebroke manor which he quitclaimed, with other property to John Thomas, clerk, and the four bishops of Worcester, Durham, Winchester and Bath and Wells. In 1445 the heirs of Philip Gauton held half of the knight’s fee (worth 50s) at Buddebroke while the heirs of Robert de Hastang (namely Humphrey Stafford of Grafton) held the other half (also worth 50s). Coleshill = in 1373 John de Peyto held some property at Coleshill from Beatrice, daughter and heir of John de Sheldon. In 1423 Elizabeth, widow of John de Clinton, held a messuage, land, tenements, a meadow and a wood at Coleshill (13s 4d). In 1431 held at his death by Sir William de Clinton from John, Bishop of Bath and Wells, Richard, Earl of Warwick, Edmund Lord Ferrers, John Weston, William Wynard and William Repyngdon who held there a quarter carucate of land from Edward Oddingeseles by unknown service. Longichynton (Long Itchington) = in 1238-1239 Gerard de Oddingeseles did homage for Longichynton which was held by his father, Hugh de Oddingeseles, from the king in chief and other lands inherited from Gerard’s mother, Basilia in Warwickshire for which he paid a fine of £50. In 1336-7 Sir John de Oddingeseles held the manor of Longichynton jointly with his wife Emma by the king’s charter and by a fine at the king’s court. It was held by the service of a third part of a knight’s fee. Sir John left as heir his son called John who was aged 24 years old. An inquisition in July 1347 found that Emma de Oddingeseles held Longichynton manor for life by the gift of Ralph Bygot who had years previously enfeoffed John and Emma de Oddingeseles of the manor by the service of a third of a knight’s fee. In November 1352 John de Oddingeseles held Longichynton in chief to the crown by the service of one knight’s fee. The manor included 28 acres of a deerpark. John de Oddingeseles, junior, his son and heir, was born at Ichynton and was baptised in the local church. In 1355 it was noted that the pleas and perquisites of Stockton manor were held in the view of Longichynton manor. In 1428 Mary, widow of Sir John Dodyngselles, held Longichynton manor of the king in chief and was succeeded by her son, Edward Dodyngselles. The manor site was worth nothing but there was 100 acres of arable land (60s), 20 acres meadow (60s), 80 acres pasture (40s), one windmill (40s), a wood that was worth nothing along with 20 messuages and 20 virgates (20 marks) with 21 marks of assize rent while the courts baron and leet were worth nothing beyond the seneschal’s fee. In 1447 Edward Dodyngseles (or as anciently spelt - Oddingeseles) held Longichynton and where he received a pair of gilt spurs at Easter for the manor of Olton from Elizabeth, Lady Deincourt, and wife of Sir Thomas Neville. Maxstoke = in about 1324-5 John de Cerne held some property at Upmelcombe in Dorset from the son and heir of Sir John de Clinton of Maxstoke by the service of a quarter knight’s fee and 100s per year. In 1349 John de Clinton of Maxstoke rented Northlydyerd in Wiltshire to Roger Normaund by a knight’s fee. In 1354 William de Clinton, Earl of Huntingdon, held Maxstoke manor from John de Oddingeseles junior of Longichynton, then a minor in the king’s ward. 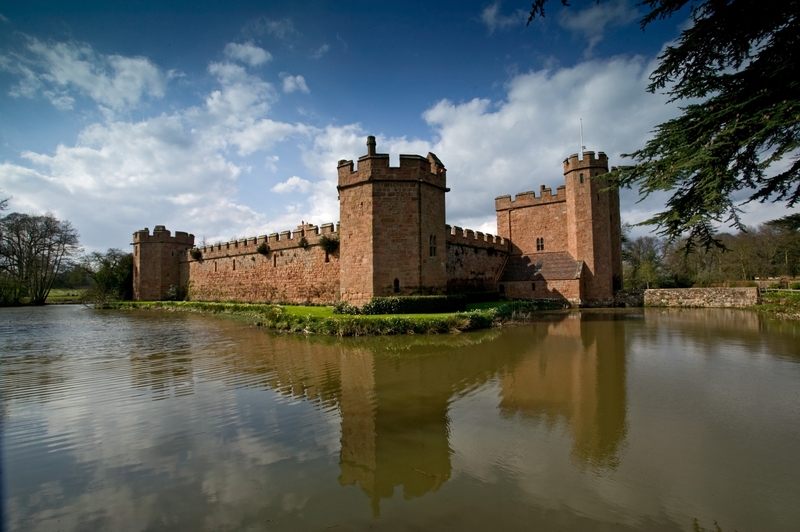 In 1423 Elizabeth, widow of John de Clinton, held Maxstoke castle (occupied by Edward Dodyngford) with four carucates (26s 8d), a pasture (6s 8d) the assize rent (102s 4d) and the assize rent of Marston and Coton. In 1431 Maxstoke was held at his death by Sir William de Clinton from John, Bishop of Bath and Wells, Richard, Earl of Warwick, Edmund Lord Ferrers, John Weston, William Wynard and William Repyngdon who held the castle and lordship with the hamlets of Coton and Lea Marston from Edward Oddingeseles by knight’s service. Merston & Cotes = in 1294-5 William de Oddingeseles had fourteen free tenants at these places rendering 36s 8d per year and this property was held of the Earl of Oxford by one twelfth part of a knight’s fee. In 1373 John de Peyto held some property at Coleshill from Beatrice, daughter and heir of John de Sheldon. In 1423 Elizabeth, widow of John de Clinton, held the assize rent of Marston and Coton (worth 22s 3d). Solihull = in 1294-5 William de Oddingeseles had the manors of Solihull and Maxstoke. At that time half of both manors were held of Sir Hugh de Oddingeseles with the advowsons by a half knight’s fee while the other half was held of Sir Robert de Pynkeny by socage and rendering a pair of gilt spurs for Solihull and a half knight’s fee for Mxstoke. In 1311-2 John de Grey of Rotherfield held Solihull by the inheritance of Margaret his wife from Sir John de Oddingeseles for a fourth part of a pair of gilt spurs. The property generated 22 marks in yearly rent. John de Grey also held the advowson of Arley church by the same inheritance from the same Sir John. In 1321-2 Alice de Caunton held a fourth part of a messuage and a half carucate of land at Solihull from John de Oddingeseles by fealty only. She also held half of Pirton manor in Hertfordshire. In 1359 John de Grey of Rotherfield held £16 11s of yearly rent at Solihull from John de Oddingeseles of Longichynton. Stockton = in 1355 Philip de Somerville held Stockton manor by gift of John Prynce, chaplain, and John de Warr to Philip and his deceased wife, Margaret, with reminder to Rees ap Griffith and Joan his wife for her life. Stockton manor was held of John de Oddingeseles junior of Pirton, then a minor, with the pleas and perquisites due to Longichynton manor. An inquisition in 1356 found Rees ap Griffith held Stockton jointly with his wife, Joan (who survived him) from John de Oddingeseles junior, then a minor. Rees ap Griffith left a son and heir, also called Rees ap Griffith. The chief properties of the Oddingeseles family were at Pirton in Hertfordshire and Longichynton in Warwickshire but the family also held various properties across middle England from whole manors to a messuage and a few acres or just a knight’s fee. Each property held by the family has its own history, the bare outline of which is given above. Each property also had different layers of ownership often involving the families of Corbet, de Grey of Rotherfield, and Clinton of Maxstoke. Reconstructing a medieval estate encounters all these layers of history and also has to deal with gaps in the records that leave decades of history in the dark but that is the fun of medieval history research – you never quite know what you will find.